That was what the time read when Raheem Sterling’s curler found the top corner of the net to give City the lead and the 3 points. For the second time in a week, City won it at the death. For the second time too, Sterling found the winner. Many in football or sports in general believe champions are made from gritty wins and last minute winners, especially when the team isn’t playing well. It was the hallmark of the great United sides under Sir Alex, and perhaps the greatest team in Premier league history - Arsenal Invisibles - who City are trying to emulate, also had an aversion for losing, scrapping wins and just plain refusing to lose. And the saying is true. Champions are made of winners, and that willing to do whatever it takes, never giving up, and believing - with almost goat-like tenacity, to start again. And then go at the opponent, again. And again. Channeling something deep, defeating both mental and physical barriers in the process. Yet, last night’s game, like the one against Hudderfield, showed us something: City missing their swagger and penetration. Yes, as usual, they had all the possession. Yes, they played the better football. But the relentlessness in their dissection of the opposition and sheer ability to cut through any defence was missing. While this is for the mental and passion merchants out there, the team, technically, were in both games, below their own lofty standards. 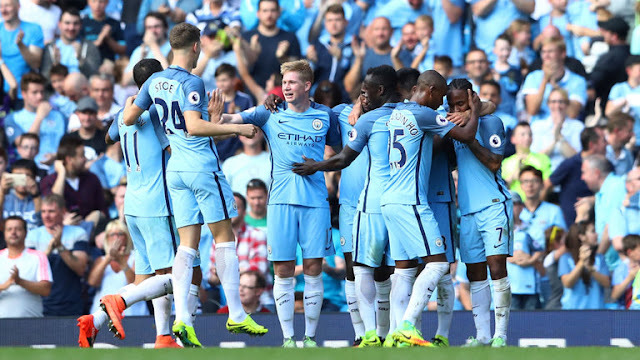 Is it physical, or that teams are beginning to know how to play City? Probably the former, but considering this is beginning of a heavy schedule for premier league teams, will they come undone, like last season? While last minute wins can be more satisfying, and build character, doing it every other match, especially for a team that was finishing off teams before the 70th minute should make every other pundit raise an eyebrow. I would if I was a City fan. They came undone around this point of last season, and by December/January, looked dead on their feet.